All of us benefit from regular physical exercise. Indeed, exercise is recommended at all ages, from children to elderly, as an inexpensive way of maintaining and improving health and wellbeing. In addition, patients with conditions such as diabetes, obesity, depression and myocardial infarction also benefit from appropriate regimens of exercise. However, it was not until recently that we began to understand the mechanisms underlying the benefits of regular physical exercise. New studies indicate that thyroid hormones play a role in this process, and might contribute with the improved skeletal muscle function observed after repetitive exercise. The thyroid gland produces two forms of thyroid hormones, i.e. T4 (inactive) and T3 (active) and secretes both into the general circulation. The skeletal muscle has the ability to take up thyroid hormone and utilize an enzyme known as the type 2 deiodinase (D2) to activate T4 to T3. This occurs inside the muscle fiber by removing one atom of iodine from T4. Thus, the amount of T3 inside the skeletal muscle cells depends on the level of circulating blood T3 as well as the D2 activity that produces T3 locally. Although we know that D2 expression does not play a critical role in skeletal muscle under basal conditions, new studies indicate that expression of D2 in the mouse skeletal muscle (the calf muscle soleus) increases by about 3-fold after an acute treadmill exercise session. While the acceleration of D2 activity is not sufficient to affect blood levels of T3, it is expected that T3 concentration and signaling within the skeletal muscle increases as a result of exercise-induced D2 expression. To test whether this acceleration in D2 activity during exercise is important, investigators looked at a mouse that is genetically modified to lack D2 in the skeletal muscle. This animal has normal baseline metabolism but exhibit partial loss of the beneficial effects after acute or chronic exercise. 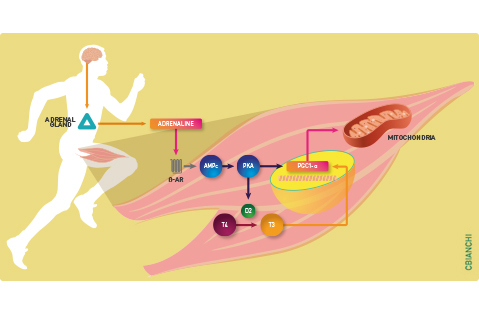 Specifically, skeletal muscle lacking D2 failed to increase the expression of a key transcriptional factor that controls the function and the formation of mitochondrion known as PGC1-α in response to physical exercise. It also failed to accelerate the activity of an important mitochondrial enzyme, the citrate synthase. The mitochondrion is the cell structure that converts food energy into cellular fuel utilized for the normal cell and skeletal muscle metabolism. Notably, diseases such as diabetes, obesity and hypothyroidism are characterized by decreased number of mitochondria and/or impaired mitochondrial function in skeletal muscle. Thus, the fact that intracellular production of T3 via D2 is activated by exercise, which leads to increased expression of PGC1-α and the key mitochondrial enzyme citrate synthase supports the prescription of exercise as a non-pharmacological way of increasing thyroid hormone signaling in the skeletal muscle. Data from studies in which physical activity was correlated with gene expression in human skeletal confirm these studies in mice by demonstrating that Dio2 mRNA levels in human quadriceps is positively correlated with physical activity. Future studies should elucidate whether thyroid hormone activation in skeletal muscle is important for energy expenditure during exercise.